Paint Shop Pro 7 has quite a few Retouch modes under the Retouch tool, the pointing finger tool in the middle of the Tool Palette. Select variations on the Tool Options Palette as with the other Tools. Some variants are like the Color Adjustment commands while others are like photo retouching effects. Use the Retouch brush when you want to paint with the effect rather than apply it to the entire image or selection. Although the tool uses the same brush tips as the other brushes, you don’t use it to apply paint. You use it to lighten, emboss, change the saturation, and make other retouches to your image. Let's explorer the variants on the Retouch tool. 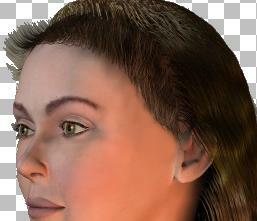 Open hairtest.jpg in Paint Shop Pro, or any 24 bit image you want to practice on. 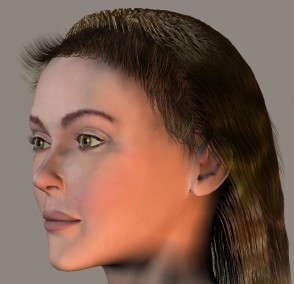 Open hairtest.jpg in Paint Shop Pro. Or open a 24 bit image to practice on. Choose the Retouch Tool from the Tool Palette and make sure the Tool Options Palette is showing on the screen. If it is not, press the "o" key on the keyboard, or the Icon on the Tool Bar across the top. 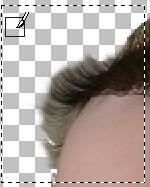 For example purposes only, I put selections on the images to show where I am applying the Retouch effect. Use a selection to limit the work area, or not, whichever is more comfortable for you. Sometimes I find the selection marquee is visually distracting. On the Tool Options palette, click the down facing triangle at the bottom bringing up the Retouch mode options. Scroll up to the top using the scroll bar on the right side. Pick the Lighten RGB mode. Lighten RGB increases the brightness of the pixels painted over. Set the shape to Round, Size to 25, Hardness to 0, Opacity to 100, step to 25 and Density to 100. 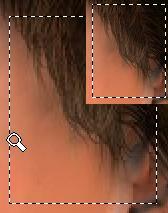 Notes: For the Retouch tool, as with the regular brushes, the Hardness controls how soft the brush edges are. At 0, the brush is very soft, at 100 percent the brush has very abrupt and hard edges. Opacity controls how strong the effect is applied. At 100 percent, the Effect is very strong and at 0 percent the effect is nil. Lighten RGB is a build up effect. The more you "paint" over an area, the stronger the effect becomes. Two passes across the hairline area. Four passes over the top of the hair. Why use it? Perhaps to add a highlight to a face. One pass over the cheekbone with the Lighten Mode. Undo these effects by pressing Control Z several times until the image is restored to original. On the Tool Options Palette from the mode drop down pick Darken RGB. This decreases the brightness of the pixels. Darken is also a build up mode, the more you go over an area, the darker it gets. The Darken RGB mode is effective at creating shadows. Undo the the shadow effect by pressing undo on the keyboard. Next choose the Soften option from the mode fly out on the Options palette. The soften mode smooth edges and decreases contrast. Notice that with two passes, the pixels are much softer. Try the same near the chin area. Using soften helps blend the edges of one image into the background of another. 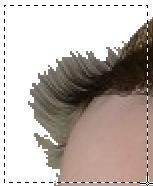 Undo the changes to the hairtest image. Pick the Sharpen tool on the Options Palette for the Retouch mode. Select the transparent background with the magic wand tool. Do a Selections > Expand > 3 pixels (or width of the edge you want to work on. Pick the Retouch tool and Soften, then work the edge of the object blurring the pixels. The Selection will prevent you from softening the object beyond those 3 pixels. Below. Like using Sharpen filter from the Effects menu, Sharpen retouch mode heightens the edges and accentuates the contrast of the pixels. See below. 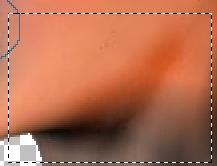 Be careful using the sharpen tool as overuse will pixelate the image, leaving ghostly artifacts along the edges! Personally I prefer to use Unsharpen Effect on a whole layer or on a whole image rather than this mode of the Retouch tool. The results are more consistent. 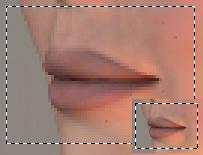 Undo the changes and pick the Emboss Mode for the retouch tool. The Emboss tool "causes the foreground to appear raised from the background by suppressing the color and tracing the edges in black." From the PSP Help Files. I hate this mode and never use it. On the face, remove any selections. this one is obvious. Paint around the edge of the face. Sigh. WHY? If you find a use, let me know pl ease! Next is the Smudge tool which IS very useful!!!! Smudge Mode spreads color from the starting point and picks up color as it moves. The effect is similar to smearing paint. Set the size to 10 pixels on the Tool Palette. 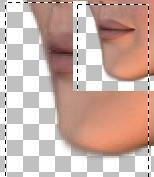 Click in the grey on the right side of the chin and drag inwards. Click in the face and drag left into the grey. Note the results, then Undo. 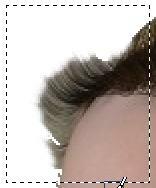 Up at the top of hair, run horizontally centering the mouse where the hair meets the background. See below. Where can we use this? On an image with a rough layer. 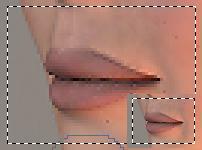 Use the Smudge tool set to a small size, such as 10, clean up the edges. Smudge tool in from the white. Turn off the white background to see the effect on the layer. In a transparent area, pulling from the transparent to the color adds transparency to the pixels you drag over. 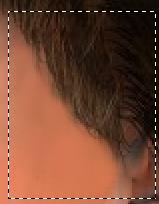 You can use the Smudge tool along the edges to get rid of ugly aliasing and off color pixels. Practice with the smudge tool to get a feel for how it handles. You know, like trying out a new car. Undo your smudging by pressing the undo key until back to the original, or Click on Edit on the Menu Bar, Command History> and undo the steps there. Pick the Push Mode on the Retouch Tools option palette. Push is similar to Smudge but doesn't pick up any new color. Click in the grey and drag across the image. A grey stripe passes through. 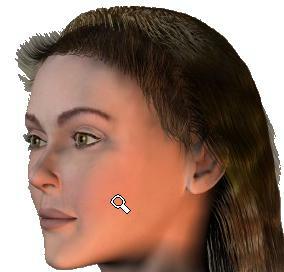 Undo then start in the brown hair and drag, a brown stripe follows the mouse. Push might be useful to reshape an area with a known color. Let's suppose we want to get rid of some of the hairs by the ear. Start in the cheek area and work up into the hair line. Push color up there. Undo all the Pushing and choose the Dodge mode on Retouch Options Palette. Dodge lightens and brings out details that are in shadow. Dodge lightens and brings out details that are in shadow. 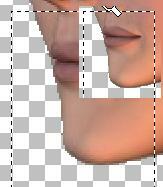 Working on the chin line on the face image, with opacity at 100 percent. ARGGHHHHH. Undo it. The trick here it is to use a low opacity setting. Try setting to 5. This way you can Build up the effect slowly. Undo the dodging and select Burn option. Burn is the opposite of Dodge, thus darkening areas in a image that are too light. At 100 percent opacity it will turn the pixels black or very over colored. Again the trick is to use the dodge mode at low opacity settings. Set to 5. With a size around 30. Under the chin, accentuate the shadow and pull it up a bit higher towards the ear. 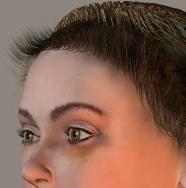 Using the Burn tool, we can give this face a really nasty looking black eye! Go fiddle with these Retouch Modes. Next week we will explore the rest of the modes which are targeted to changing the Saturation, Hue and Lightness Values. I find the retouch tools excellent for Tweaking a mostly finished image. I think they work best on a very small scale.